July | 2012 | Wait…So That's What Catholics Believe?!?! I had to sit on a crowded bus filled with teenagers all night long, sleep on an air mattress in a room with smelly teenage boys, eat school cafeteria-style food and work in the hot South Carolina sun for an entire week. However if I had a chance to do it again, I would do it in a heartbeat! I am referring to Catholic Heart Work Camp 2012. I had the joy of taking 13 of the high school students and 3 adults to Hardeeville, South Carolina for a faith-filled and work-filled week. 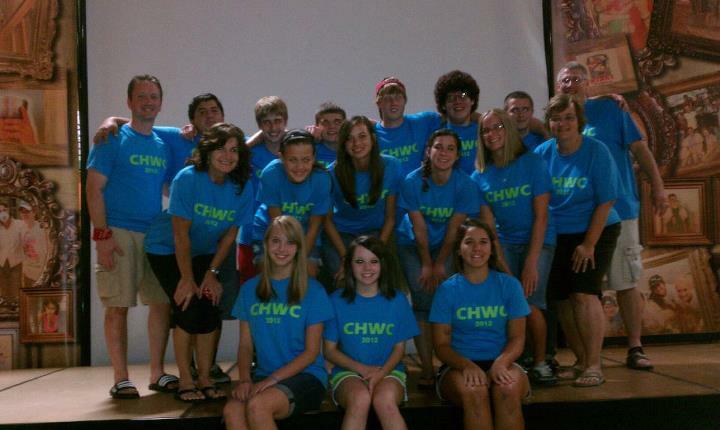 This was my second year going to CHWC and I pray it won’t be my last! As the youth leader, I was proud of every one of the students that represented St. Andrew’s at CHWC. Not one of them complained or slacked on their job sites. The biggest fear of being in charge is having to deal with disciplinary problems and I was thankful to have such a great group of young men and young ladies representing our parish. The best part of the week from my perspective was watching these young people come out of their shells and get excited to be Catholic as the week went on. When we first arrived, it took awhile to get settled in to our rooms and unpack. Then we had the joy of trying to find out where everything was located (bathrooms, showers with ice cold water, cafeteria and snacks, etc). The first night is every teenager’s favorite part (sarcasm intended)…ICEBREAKERS! All +300 kids were broken up into groups of 6-8 along with 1-2 adults. There were roughly 48 different groups and 1-3 groups per work site. 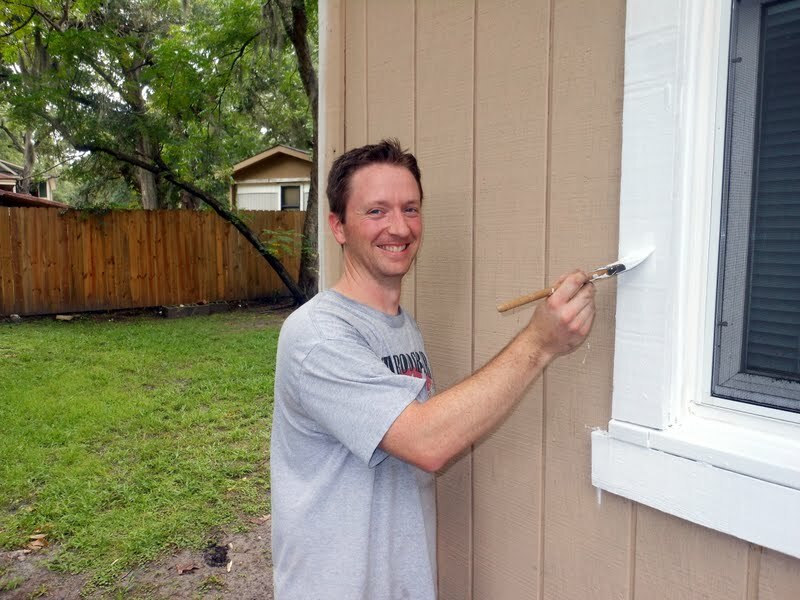 Most of the sites involved painting or cleaning residential houses. We would spend the next 4 days working from the morning until the late afternoon at these sites. The thing that really made the week special was that every morning we opened with Mass and then ended the day with a program that engaged the teenagers. It really energized you in spite of working in the hot sun. Even the adults leave CHWC with a renewed Catholic spirit. The two most powerful nights were when we had Eucharistic Adoration one night and then Four Corners the next. Adoration was in the gym and all 350 in attendance kneeled in silent prayer around the Eucharist. Hearing the emotion coming from many of the kids made me realize they understood what a special gift we Catholics have in the Eucharist. Four Corners was equally powerful. I had the opportunity to sit down and listen to teenagers pour out their heart to me about their fears and problems and then we just sat there and prayed together for God’s help. Powerful and emotional are the two words that come to mind when I reflect back on those events. 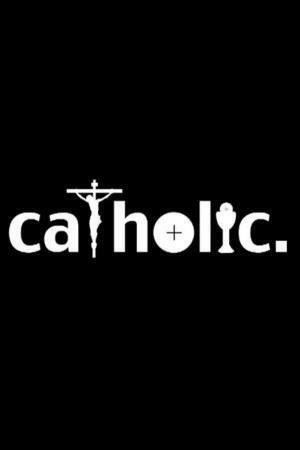 I believe every Catholic youth should participate in something like CHWC. It gets them excited about their faith, makes them appreciate what they have and encourages them to go out and spread the Gospel to others. If all the Catholic teenagers are like the ones I met at CHWC, our Church has a bright future! At the request of some of my fellow Catholics, I am going to start posting my homilies and reflections on this blog. I hope they inspire and challenge you to always continue to follow the Gospel of Jesus Christ and His Church! 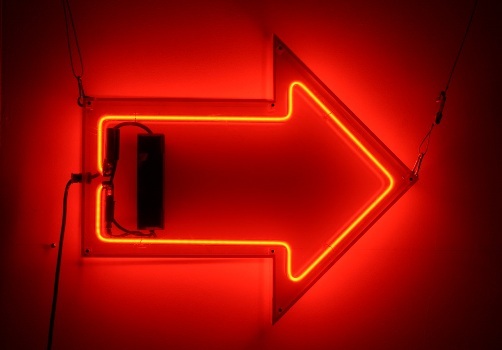 I wish God spoke to me in big bright…..flashing…..neon signs…..but he doesn’t. If he did, I probably would have less debt, less stress, less temptation and less sin in my life. To answer that, I want to talk about today. On the church calendar, we call today the Most Holy Trinity. It’s a day set aside to give special Honor to our triune God. I want to ask the younger kids a question, just go ahead and shout out the answer if you know it. What is 1 + 1? What is 2 + 2? What is 1 + 1 + 1? So then how can one Father + one Son + one Holy Spirit = 1 God? Christianity can be so confusing at times!!! But that’s just it, sometimes we need to just throw up our hands and say, “God, I don’t understand everything and I don’t know what you want out of me, but I’m going to trust you.” You see God knows the beginning and so do we. We’ve seen and studied the past, a past created by God. The problem is, we don’t know the future…but God does. He’s seen the entire story of our lives, the beginning and the end, whereas we’ve only seen a small chapter of the entire story. And now we suddenly want to skip to the end? Where’s the fun in that? Or should I say where’s the trust it that? Five years ago, Deacon Richard came up to me and said, “Brian, I think you’d make a good Deacon. There is an informational meeting that you and Angie should attend.” My first thought, besides that Richard drank too much of the alter wine, was that I was too young. So I went to Fr. Danny and he pulled out a canon law book and we read that the minimum age one had to be at ordination for a permanent deacon was 35. After doing some quick math, we realized I would turn 35 about 4 months before ordination. There’s one excuse out the window. Our next concern was our young kids. They were 2, 4 and 6 at the time. We went to the informational meeting and found out that we had to meet one weekend a month for five years for classes. 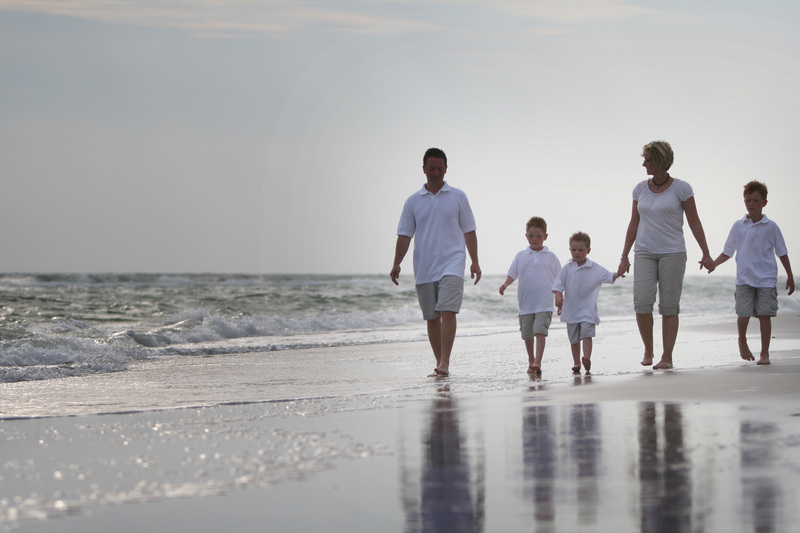 We didn’t know what we would do with the kids? There was a couple at that meeting in Deacon Rich’s class that was in the same situation. They had young kids and no family close by. They told us they were scared about finding sitters to watch the kids, but it ended up working out in the end because their friends volunteered out of the blue to help out. So we decided if it became too much of a hardship to find people to watch the kids, then that was God’s way of telling us this is not the right time. I can honestly say that in the five years of classes, only a few times did we have trouble finding someone to watch the kids. Angie and I owe a big thank you to both our out of town family and our St. Andrew’s family who stepped up and helped us without hesitation. THANK YOU! So I guess excuse #2 went out the window as well. You see I was trying to skip to the end, when I was only at the beginning. Granted there were plenty of times during the past 5 years that I struggled with God’s call, but I kept praying and trusting God, even when I didn’t get that big bright, flashing, neon sign. It’s all about trust. All three scriptures we heard today tell us to trust. First God tells us to “fix in your heart that the Lord is God.” In other words, God is saying, “let’s get one thing straight here, I made you and I am a part of you, so don’t doubt Me!” If we can fix God in our hearts, then the Spirit of God will lead us and we will be called children of God. Therefore we need to rely on our heavenly Father to guide us in all things whether we understand them or not. But what if we trust God and still it seems like we are getting slapped in the face day after day? 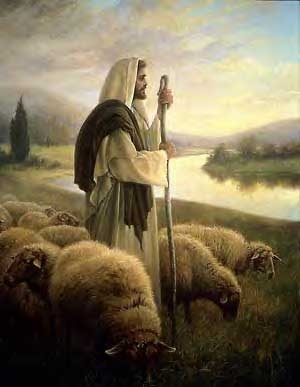 Even the Apostles, Jesus’ most trusted inner circle of followers, had their doubts. One even betrayed Him! We hear in Matthew that the Apostles “worshiped, but they doubted.” How did Jesus react to those most trusted friends when they worshipped with doubt? Did he condemn them or yell at them? Did he suddenly say, “of course the Trinity is three persons but one God why don’t you get this?” NO. Jesus knew that people wouldn’t understand everything. He even knew that some would doubt Him. But he still told his followers to go out and spread the good news. 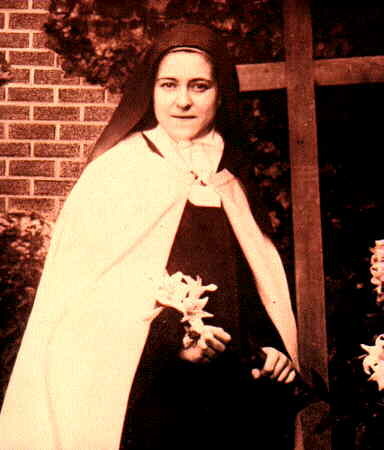 When it feels like you don’t understand or trust God’s plan or you feel like God had abandoned you, we can rely on the words of St. Therese of Lisieux when she was asked about this feeling of abandonment. She said, “I turn to God and the Saints, and in spite of this feeling, I thank them, for I am sure they only want to see how far I am going to trust them.” God knows the entire story. You may not understand all the chapters, but take comfort that the author of the universe, the author of the bible, is the same author of your life. Trust Him. I joined the Catholic Church at the Easter Vigil in 1999 after going through RCIA in Ohio. I distinctly remember Deacon Tom, who taught the RCIA classes, say something that stuck with me for 13 years now. He said that if we really enjoyed learning about the Catholic faith, we needed to make sure to pay it back someday. He was encouraging us to keep learning about Catholicism and help others do the same after the Easter Vigil. He told us not to become “luke warm” Catholics but to volunteer and get involved. Deacon Tom was the first one to plant a seed that would eventually lead me to becoming a Catholic Deacon 13 years later. Shortly after that Easter Vigil, Angie and I moved off to Iowa for a few years to attend college. We got busy with school, work and the birth of two of our boys. Church was not a high priority on the list because life was too busy. We didn’t get very involved in our local church because we knew we’d only be there a few years. We had our struggles in Iowa as well. The cost of Chiropractic College, being newly married and then being young parents can really put a toll on a young couple. After moving to Kentucky from Iowa, we started attending St. Andrew’s. It was here that more seeds were planted. Fr. Joe was the first priest I got to know on a personal level. He encouraged me to help teach the high school formation class. When a new pre-marriage program was starting at the diocese, Fr. Joe suggested Angie and I to become trained instructors. It was at St. Andrew’s that I became an extraordinary minister of holy communion and a lector. Angie and I felt at home here and really enjoyed getting involved in the parish. The problem was that with each thing I volunteered to do, I felt called to do more. It was then that Deacon Abbey mentioned something to me about becoming a Deacon. I immediately blew him off. Apparently the Holy Spirit was working in me because I kept coming back to that word…Deacon. Who am I to be a Deacon?!?! So I asked a few people in the parish that I highly respected what they thought about me becoming a Deacon. Each one of them encouraged me to pursue it. More seeds. I often wondered why I struggled so much early in my Catholic journey. The only answer that made sense was that it was leading me to June 2, 2012. That is the day I will be (God-willing) ordained a permanent deacon. Even as I write that line, I am filled with emotion that I cannot describe. I’m not big into public confessions but just know I’ve had my share of struggles in the years following that Easter Vigil in 1999. I truly believe that God allowed me to go through that journey so that I would one day be able to help others through similar struggles. Deacons are ordained to serve the Church by serving others. I am truly humbled by the opportunity God has put in my life to serve His Church as a deacon. It would not have occurred though without the many seeds that were planted by others. That is why I encourage each and every one of you to plant seeds. If you think someone would make a good priest, deacon, monk, nun, etc. don’t be afraid to tell them! You never know what kind of fruit the seed you plant may bring. The soon-to-be Deacons, their wives and Bishop Ronald Gainer on retreat about one month before ordination. 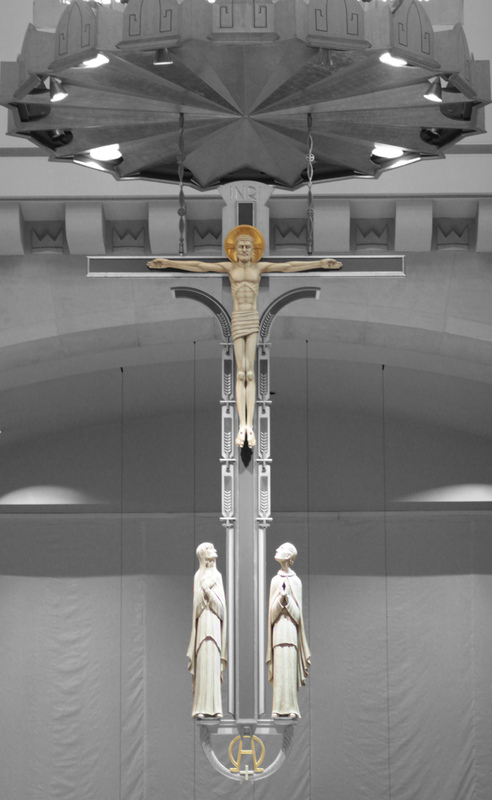 Please continue to pray with and for me and for the other 22 men being ordained as deacons on June 2, 2012 at the Cathedral of Christ the King during the 10:30am Mass. Consider this your invitation from me to attend! It is truly an awesome sight to see all of the clergy in our diocese come together with the Bishop for such a celebration. I especially encourage you to attend if you have ever considered holy orders a possibility in your future! I look forward to serving the St. Andrew’s community for many years to come. It was a packed house. Friends and family from all over crowded into the Cathedral to witness the ordination of 23 men to the diaconate. Three of those men would, God willing, go on to become priests. Twenty of those men would be ordained as permanent deacons. Angie and my youngest son (Jacob) were anxiously waiting in their pew while my two older boys were dressed in red cassocks waiting to process in with all the deacon candidates, deacons and priests of the Lexington Diocese along with Bishop Gainer. The incense was lit, the church choir started up and off we went. The procession itself was a sight to see. To see all of the ordained clergy of our diocese come together for such a blessed event was powerful. It was a three-hour Mass but all I could think about was those five years of formal classes were behind me. Where in the world did the time go? Now all of a sudden I was kneeling before the bishop in front of the altar at the Cathedral of Christ the King. 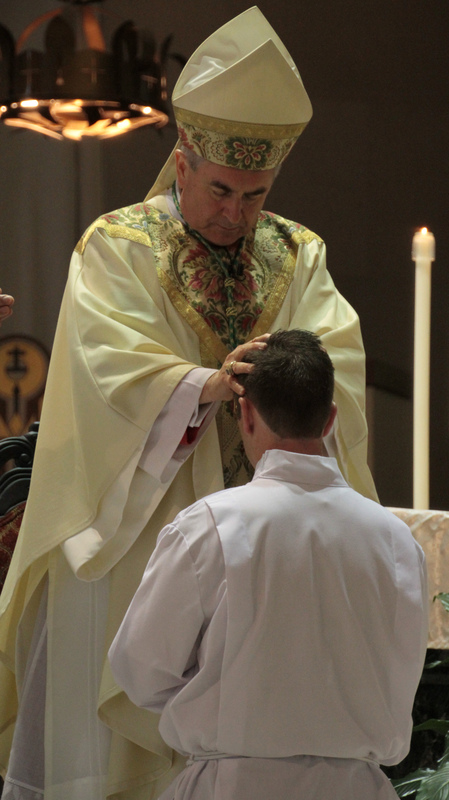 Bishop Gainer laid his hands on my head in an ancient rite that dates back to the time of the Apostles. These men were the first deacons of the church. I was nearly moved to tears as I felt Bishop Gainer’s hands upon my head. God had chosen me to that same group we read about in the Book of Acts. Ordained to serve the church and the community but also ready to lay down my life for the church. This example is given to us also from the Book of Acts. St. Stephen (the first deacon of the church) was also the first martyr of the church (Acts 7:60). This is what was going through my mind as I arose from my knees after Bishop Gainer laid his hands on my head. Humble, obedient service to God and His church. I really didn’t “feel” different, but I knew that I “was” different. No more excuses, God now gave me a mission to serve His church as a deacon. I encourage all of you to ask God to give you guidance when discerning your vocation in life. This could be to religious life (priest, monk, nun, deacon), married or single life. God has a purpose for each and every one of us. The hard part is to remain humble, obedient and quiet long enough to listen for the Holy Spirit to move you in the right direction. Remember, prayer is a two-way conversation. It involves talking AND listening. Listen for His answer and be ready to follow it even if it takes you out of your comfort zone. God’s plan is so much easier when you join Him rather than resist Him!